Our mission is to be a Christ-centered community of prayer and worship, of welcome and care, of learning and growing, of witness and service, in the worldwide church of Jesus Christ. We are a loving, Open and Affirming church family that cares deeply about our faith, about those with whom we share Christ’s teachings, about those who need a helping hand in life, about our community, our country and our world. We are a mature congregation. Our members hail from many different backgrounds. 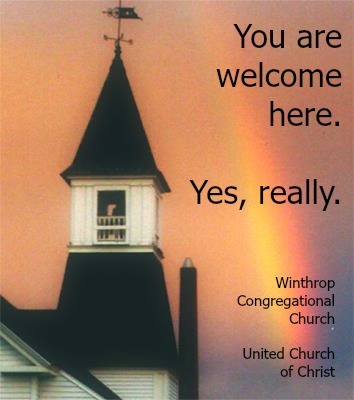 We gladly welcome people of all races, ethnicities, sexual orientations, ages, and past denominations to worship with us. Our sanctuary can be accessed with an elevator and there is a paved ramp to the main entrance. We are happy to be able to offer our space for other groups to use. AA, exercise classes, craft groups and others use the fellowship hall on a regular basis. We like to throw a good fundraiser. Our renowned Fish Chowder Luncheon, summer fair, sidewalk art show luncheon, Christmas Fair, and other fundraising events should not be missed. We own a rustic camp dwelling on Maranacook Lake in Winthrop that is a God-given, natural jewel. We worship there sometimes in the summer. We also just like to spend time together outdoors. Our camp is a great place to get together to learn about God and get to know each other better. ​To put it simply: We are a friendly, accepting bunch. We hope that newcomers feel welcome as soon as they enter the church doors. Want to learn more? Click on the links in the dropdown menu under "Who We Are."